Lycoris knew that no one would understand her inability to return to the arms of her one true love. If it was just her life she had to consider then she would have left in a heartbeat, but she had her daughter to think of. She couldn’t just uproot her daughter and take her to some mythical land to meet her father without there being some sort of backlash. Perhaps, she was being a coward, but she wanted to think Delphinus still loved her just as ardently and passionately as she loved him. To go back and find that he had move on? Well that would have shattered her heart further, and it already felt as if it were fluttering tenuously in the breeze. She regarded her mother bitterly. Not for the first time in her life. Her mother had been distraught after the death of her brother, and she had made Oliver and Lycoris promise her that they’d never return to the realm that brought she and her brother happiness. Not until her mother was dead. Not for the first time she cried when she thought of how selfish her mother had been. Oliver had grown so angry that he had actually confronted their mother and got slapped in the face for his troubles. She sighed. She missed Oliver. He, of course, persisted that they all ought to go back. He hadn’t relented since the day her mother had died. She knew he was anxious to see Qua again even if she had hurt him. However, he made her promise that for Calliope’s sixteenth birthday they would return to Ladriél. Perhaps, it was a moment of weakness and perhaps it was something that she ought of disagreed upon, but she had agreed. However, the words that fae had told her all those years ago danced around in her mind. She had been told that she would never return to Ladriél to the love whose song granted her all the merriest wings of happiness. She pushed those worries aside and began reading. It wouldn’t do to return to her lovers land without, at the very least, remembering his language. Chapter eight of Crimson Betrayal is nearly finished. Something I’m grateful for. I’m a little annoyed, though, because my computer ate part of that chapter so I’ll have to rewrite a bit of it. Yet the idea I had for it that got swallowed up is still etched in my head, so it will be all right. I will rewrite that and then I’ll be happy. My coworker Nate was asking me a lot about Amethyst Epiphany last night. Without giving too much away I did tell him the general synopsis, and he said that he could already tell it was going to be awesome, and he promised to buy two copies. He said I had to sign them, though. That made me feel good, though, to know that even though I work a crappy job that a lot of my coworkers plan on buying my book means a lot to me. I can’t wait until it’s published. I will be happy dancing all over the place I’m sure. Haven’t started revisions yet, but I’m hoping that it’s nothing too drastic. We will see. All I know is that I’m happy it’s getting published. It just seemed like a distant dream that would never happen, but it’s happening! & I hope this only the beginning of good things to come. I looked at her. She loved him, and I knew it. It broke my heart to know my sister would have to break her heart to keep a promise to our mother. It was selfish, and I have to admit I really hated my mother right now. How could she be so vicious and heartless? Lycoris said people mourned differently, and perhaps that is true, but to angrily lash out at the people that loved you – well, that didn’t seem healthy to me. Nor did I want to go back to The Realm of Normalcy. It was full of petty, little people with lack of imagination. Not to mention there was no Delphinus there for Ly, and my Qua…oh, goodness, knew I didn’t want to let her go. Yet I had to. I had made a fool of myself, and well, she probably didn’t want to see me again…not after what I had accused her of. Especially given she had been innocent. Still I had blamed her, and I hadn’t apologized. I was too ashamed of mistake. Too proud to admit I was wrong. I was hoping she’d just forgive me. Mother was making us go home, and Lycoris looked as if she would rather take a knife through the heart. Delphinus I knew had to be a wreck. His father was on the verge of dying, his mother already gone. He was about to become a king without his Queen. We all knew that he wanted Lycoris to be his queen. My sister would have loved to be his queen. Yet our interfering mother made us promise we wouldn’t come back to Ladriél. She amended it later to say we could come back when she was dead, but that was little comfort to Lycoris whose heart was shattering more and more the further we drew away from Delphinus. My eye’s watered, too. I tried to brush them away without Ly noticing, but she did, and she hugged me. I nodded. Yet it was a hollow solace, and we both knew it. “Thank you,” she remarked, her knuckles white and taut, clenched tightly enough to cut off circulation. And I knew that was a small comfort indeed. Mother didn’t seem to realize she wasn’t the only one grieving. Yes, we missed Richard – we weren’t monsters, after all, and he was our brother. Yet our hearts belonged with the fae and mermaids we were leaving behind. It didn’t seem as if she cared how badly our hearts were shattered as long as we were safe. I had half a mind to jump off that boat and swim back to Ladriél, but I knew that mother would never forgive me if I did, and as much as I hated her in that moment – I knew that I’d regret alienating myself from my family. Besides, I had to be strong. For Lycoris’ sake if nothing else. It’s funny how I get the greatest ideas, sometimes, just by walking home from work. I’ve gotten some ideas for the second book of this series entitled Crimson Betrayal, but most of my ideas are flowing forth for the third and final novel of this series Emerald Restoration. I, however, have to tell myself constantly that I need to finish the second before I can go onto the third. My muse is persistently resisting this, insisting I write the third then the second which makes no sense to me, at all. I usually say go where the inspiration flows, but I definitely think it’s a better idea to finish the second before starting the third. Amethyst Epiphany is an universe I know I’m going to have a hard time letting go even after I finish the series. The characters and I have grown so close over the years, and I’ll probably end up writing short stories about the characters after the series is done. I’m curious, though, as to what you would like to be or what you would be if you were part of a fantasy world? If you were a part of my universe which would you prefer to be: a lamia, a naga, an elf, a mermaid, a chimera, a siren, a faerie, a vampire, a dwarf, a druid, a nymph, or a sprite? And which one do you think you’d really be (based on personality, etc.)? If you would like to follow me on facebook, feel free to do so here: https://www.facebook.com/pages/Linda-M-Crate/129813357119547. Invite your mother, your friends, your grandma. Not even kidding. Anyone who supports writing feel free to invite them. I write poetry, short stories, articles, and reviews in addition to this novel of mine. Oh, by the by, speaking of Amethyst Epiphany I wrote a short story based on this universe yesterday. The publisher I sent it to liked the story, but said it didn’t quite fit their themes so I’ll have to try to find another home for it. It really got me in the mood to start working on the sequel again which I haven’t felt much prompting to, as of late. Part of the complication being that my novel is on my old laptop that will not connect to the internet for whatever reason (which is a pity because a lot of my writing is on my old laptop). My mother is going to help me try to solve that mystery. So hopefully more work on Crimson Betrayal will happen soon. Calliope and friends are really amusing me. I invented a new character in the sequel that is pretty awesome. I think you’ll like her (at least I hope so) she’s very snarky. Unlike me, she will not keep her sarcastic thoughts in her head. So, of course, you know she amuses me. Can’t wait for Amethyst Epiphany to be published. Started compiling a list of book reviewers today for it, so I’m pretty pumped. All of my faeries have unique wings, colors, and markings. I know if I were a faerie I’d probably have my same hair color (red, blonde, brown, with the random strand of black here and there), red wings with gold trim and orange and yellow ravens on them, and not all my faeries have markings. I don’t know if I would. If I did I would like a moon on my forehead like Sesshomaru from the anime Inuyasha. If you were a faerie, what kind of wings do you think you would have? What colors or markings? 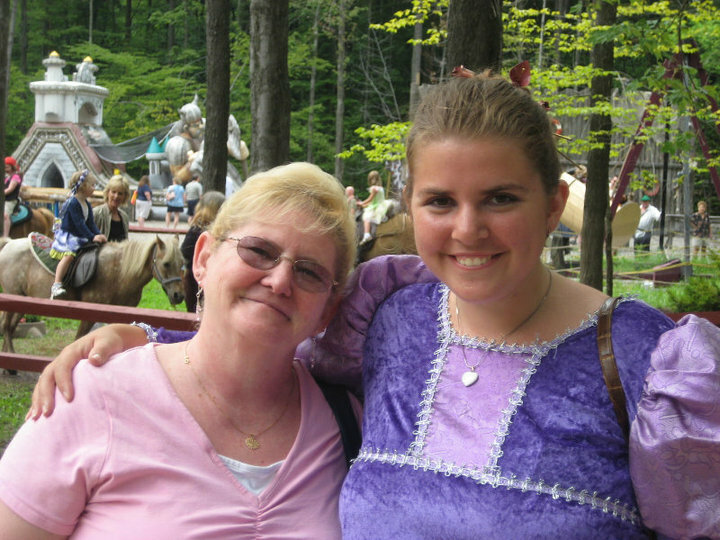 (The above photo is myself in medieval maiden adventures along with my grandmother). Hello everyone! I am the writer and poet Linda M. Crate. Writing to you all today because I’m very excited for my upcoming publication Amethyst Ephipany that is due out sometime in 2014 by the publisher Assent Publishing under their imprint Phatasm Books. It’s a fantasy novel centering around Calliope Griffin who learns that fantasy may be more reality than she could have ever envisioned it would be. I don’t want to give away the plot or any spoilers, but it features primarily faeries along with the races of: mermaids, elves, vampires, half-vampires, half-trolls, trolls, wereleopards, etc. I do have a lot of halflings because in my eyes love is blind – it doesn’t care if you’re a dwarf in love with a fae. Calliope is trying to find herself in a world she never existed, and as with our world it’s constantly trying to change her and make her different. I am currently working with the publishers right now, but we haven’t started editting or anything yet. Still, I’m excited! I’m still a little doe eyed and misty about it, I think it won’t hit me fully until the finalization takes place. Happy magic hunting, everyone! What does magic mean to you?